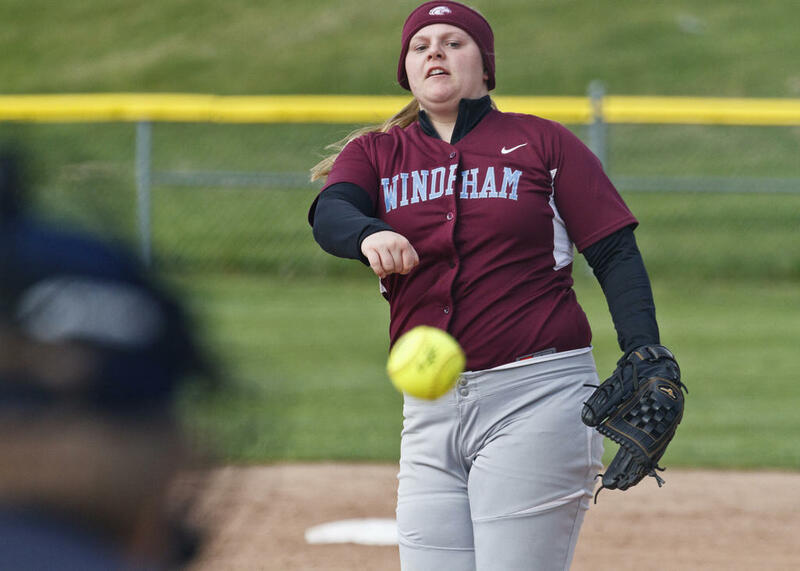 Windham pitcher Danielle Tardiff displayed, to put it mildly, ample pitching prowess against visiting Westbrook on Monday, May 16, throwing a perfect game through five innings (when the Eagles run-ruled the Blazes to win) and striking out 12 of the 15 batters she faced. Danielle Tardiff led the Eagles in run-ruling the visiting Blazes 12-0 on Monday, May 16 – and she did it on both sides of the ball. Not only did Tardiff pitch a perfect game, she cannoned one of Windham’s two homers over the centerfield fence. “You’ve got to throw strikes, hammer the zone, and Dani did that,” said Eagles head coach Travis Demmons. Tardiff finished the afternoon with 12 Ks to her name – and she only faced 15 batters. “And I told the girls,” said Demmons, “ ‘If the ball’s put in play, just make the plays.’ ” A little quick math shows that, thanks to Tardiff, the Eagles only needed to make three such plays in the entire game: on an infield fly by Kayla Horner in the opening inning, a 5-3 ground-out by Julia Symbol in the second and a 6-3 groundout by Kimmie Goddard in the third. Westbrook head coach Eddie St. John, despite the lashing his girls took, applauded their work in the field – and rightfully so: they committed just two errors, after all. “I thought that we played awesome defense,” he said. Tardiff did indeed pitch strikes: of her 67 throws, 51 found the zone. It was the first perfect game of Tardiff’s high school career (she’s a junior), though Demmons reports she threw others in her younger years. The Eagles notched just one run in the first (Katelyn Troiano) and one in the second (Megan Joy). In the third, however, they broke the action wide open. Troiano and Lauren Talbot walked onto base to begin it; Troiano scored when Olivia Mora doubled to deep right, and Talbot when Sadie Nelson doubled in the other direction. Mora crossed home on a pass ball during Tardiff’s at-bat. Then Tardiff launched her homer into the distant crowd of spectators, tallying Nelson and herself. 7-0. Mora earned the Eagles’ other HR, a three-run explosion that exited the park over the rightfield fence and scored Troiano, Talbot and Mora herself. 10-0. Windham rounded two final points – Sierra Patershall and Erin Elder – in the fifth. The W cranked Windham to 8-1 in 2016; they jumped to 9-1 when they bested the Blazes again the following day, 15-8. The Eagles occupy fifth in A South at the moment, back from Thornton (8-3) but ahead of Massabesic (7-4). They hosted Gorham (No. 10 at 5-6) on Wednesday the 18th, after Current Publishing’s print deadlines, and travel to McAuley (No. 15 at 3-8) on Friday the 20th. Westbrook, meanwhile, slipped on the result to 1-9. The Blazes fell to 1-10 in their rematch with Windham the next day, and currently rank 16th, one slot behind McAuley but one in front of Deering (2-9). They hosted South Portland (14th at 2-9) on Wednesday and visit Cheverus (18th at 0-11) on Friday. Olivia Mora of Windham leans forward to snag an incoming pass and catch Westbrook runner Kimmie Goddard out. Maddison LeBeau took to the circle for Westbrook in Windham on Monday, but the Eagles had her number from the get-go. Windhamite Katelyn Troiano jukes around Westbrook catcher Emily Talbot’s attempted tag to score the Eagles’ fifth run of the afternoon. Blazes second baseman Kiana Fuller can’t quite grab hold of an incoming pass as Eagles runner Katelyn Troiano slides between her legs for the bag. Blazes first baseman Lizzie Richardson reels in a pass to tag a Windham runner out.